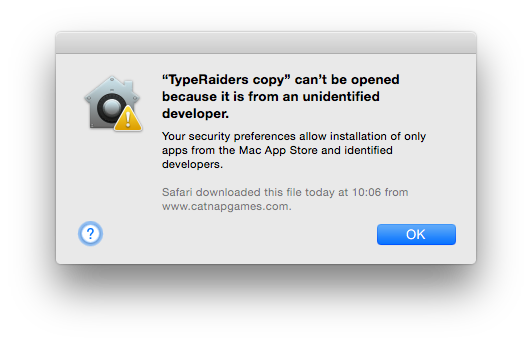 To make it easier to launch Devastro and Type Raiders on modern Mac OS X systems, I have signed the app bundles with my Mac developer certificate. You could still work around that latter dialog by ctrl-clicking and choosing Open or changing your system preferences to run any app without asking, but this seems nicer. Thanks to Andy Brice for his useful article about signing Mac apps manually.